Love is in the air today and gift shops are making merry. But, what can be a better gift for your Valentine than a short poetry written by you. And, when it comes to personalized poems, what’s a better way to express your love than to sing it. Much better than flowers and chocolates anytime. 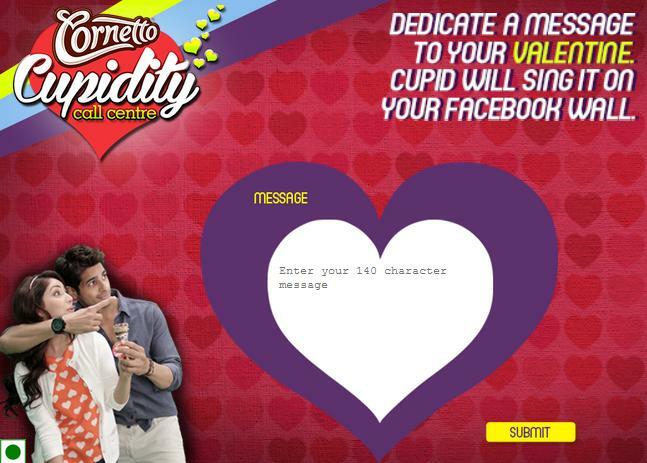 So go on and make your very own Valentine song dedicated to your love, because Cornetto will sing it for them. This Valentine’s Day, even if you cannot sing, you can dedicate your own Valentine song to your love. All you have to do is type your words in the Cornetto Cupidity Call Centre to create a song dedicated to your special someone. And cupid will sing it for you! You can find the Cornetto Cupidity Call Centre at a specially dedicated website. Additionally, it’s also made available as an app on the Cornetto India Facebook page (image embedded above). Type your love song in the heart shaped box, submit and you are good to go. The only limitation here is that your expression of love needs to be within 140 characters only. I did submit a few love lines post which the app gave options to create another Valentine song or share the fun initiative on Facebook and Twitter. Here’s a song that’s just been uploaded by the brand’s YouTube channel. However, it isn’t clear whose song it is and dedicated to whom. The channel has been uploading loads of ‘My Cornetto Valentine song’ dedications while I write this. The icecream maker has been promoting the cupidity call centre through its social platforms. The 9.5 million strong Cornetto India Facebook page has been urging its fans to #doSomethingCupid this Valentine’s. Short promo videos starring brand ambassadors and actors, Yami Gautam and Siddharth Malhotra have been doing the rounds since some time. But, most of the buzz is being created on Twitter. The Cornetto India Twitter page is abuzz with the hashtag #DoSomethingCupid. It has been sharing the promo videos, and connecting to the Twitter celebrities too. Yami and Siddharth’s official Twitter accounts are also actively urging fans to #DoSomethingCupid. In fact, it has been dedicating Valentine songs for many celebrities who are active on Twitter. This Valentine’s Day, don’t just say… sing it! #DoSomethingCupid for your partner at http://t.co/koLWGK3J6D! Visit now! Converting fan messages into songs has been done before. On the occassion of Raksha Bandhan last year, Cadbury Celebrations asked brothers to share messages for their sisters on the brand’s social media platforms, and India’s leading bands like Spud in the Box, Something Relevant then turned it into a song dedicated to her. The campaign called ‘Songs for sisters‘ had become an instant hit on social networks. Nevertheless, it has been a fun activity on social. What are your views? Hope you have dedicated a song at the Cornetto Cupidity Call Centre.